536 Duke Street, Glasgow. G31 1DL. Tel: 01415540153. This is one of the cleanest pubs in the eastend of the city. To read the full history of this old established pub click here. 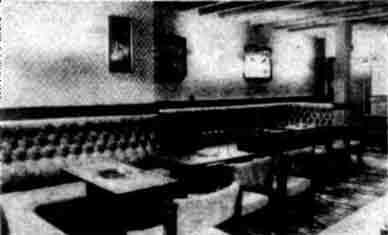 The Louden Bar interior 1978. The Louden Bar in Duke Street has always been known as a man's pub. But now that it has been refurbished it is the ideal spot for a couple to enjoy a pleasant evening out. About £25,000 has been spent on the small but cosy pub upgrading the decor. Regular customers will realise that the pub is bigger than it was. That's because Scottish Brewers took over an adjacent close and by knocking down some walls have incorporated it in the bar. The new decor is in the 30's style with lots of cigarette ad mirrors round the walls, and the floor has been semi-carpeted. As manager John Dillon, who has been at the Louden for about three years, said: "The pub has been closed for about two months but I think the time and money spent has been well worth it." Read the full story of Scottish & Newcastle Breweries four best pubs in Glasgow. Click Here. 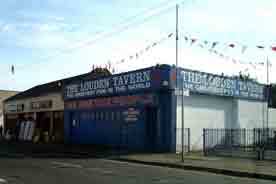 The Louden Bar. August 2005. 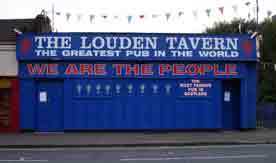 The Louden Bar. 2008. The notice on the bar door was a closure notice for a short period. 2008.